NIS America’s been a name well known for their work localizing the Disgaea series and other titles from the same eponymous developer that their namesake comes from. Traditionally, their RPG output has been strongly in the strategy JRPG sake and most recently, a couple of forays into action RPG with The Witch and the Hundred Knight series. A true turn-based JRPG hasn’t been in their library to date, and what better way to branch out into that RPG subgenre than by taking a page out of the Etrian Odyssey book? 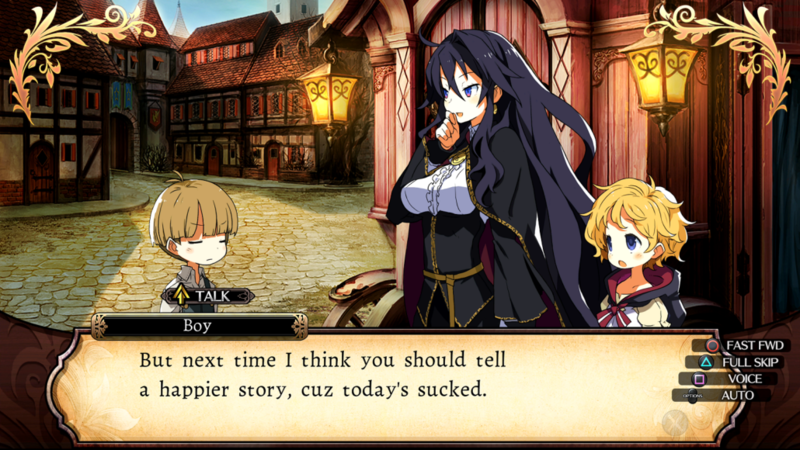 Labyrinth of Refrain: Coven of Dusk is the latest RPG from NIS America and gives the dungeon RPG subgenre a familiar look. Labyrinth of Refrain: Coven of Dusk’s story, if you could call it that, centers around the witch Dronya, sometimes known as Baba Yaga, Auntie Dronya, or a complete b*tch depending on who you ask, and her desire to explore the miasma-entrenched depths beneath the Well of Khalaza. With miasma that’s fatal to any living creature, she can’t explore these dungeons on her own; instead, she puts to work a magical book known as the Tractatus du Monstrum and an ever-growing band of puppet soldiers to do the dirty work for her. Accompanying the story’s Evil Hero is a plethora of NPC’s that often interact with Dronya in a sadistic form of slapstick humor and pun-laden gags. The style and aesthetic to Labyrinth of Refrain should be instantly recognizable if you’ve played any of NIS America’s recent titles on PlayStation 4, whether it’s the latest and greatest in the Disgaea series or that of the less exciting Witch and the Hundred Knight. The music retains Tenpei Sato’s signature flourishes, and while they don’t stand out among any of his previous works, his use of harmonica and haunting melodies are instantly recognizable. Much of the story flashes by, in short, often unrelated vignettes when not exploring the darkness below. After every great milestone that the player book pulls off, a Witch Report can be made, informing Dronya of your continued efforts and giving some insight as to where to explore next. These reports are accompanied by the aforementioned story vignettes and quick skits that are often unrelated at first but lead into one another to create a mildly intriguing story. Occasionally there are brief story events within each dungeon, but between these two sources of story advancement, you’re lucky to get a solid five minutes of lore for every hour of gameplay. 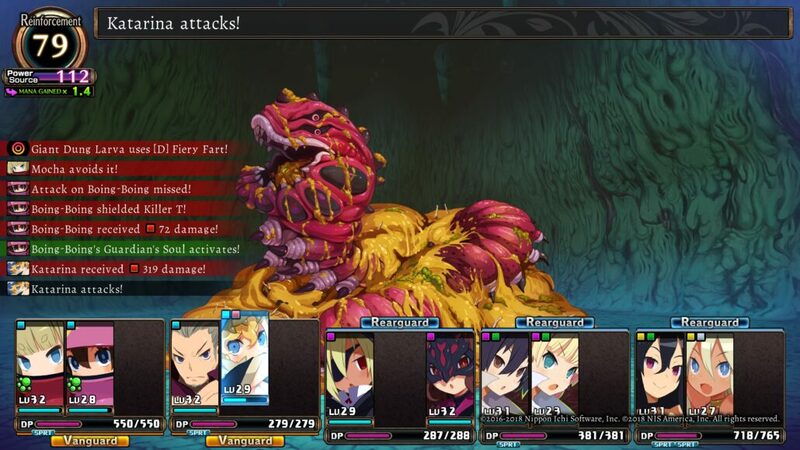 For a dungeon crawling JRPG like Etrian Odyssey, this fits the mold but fans looking for a meatier story to their JRPG will find themselves wanting more. 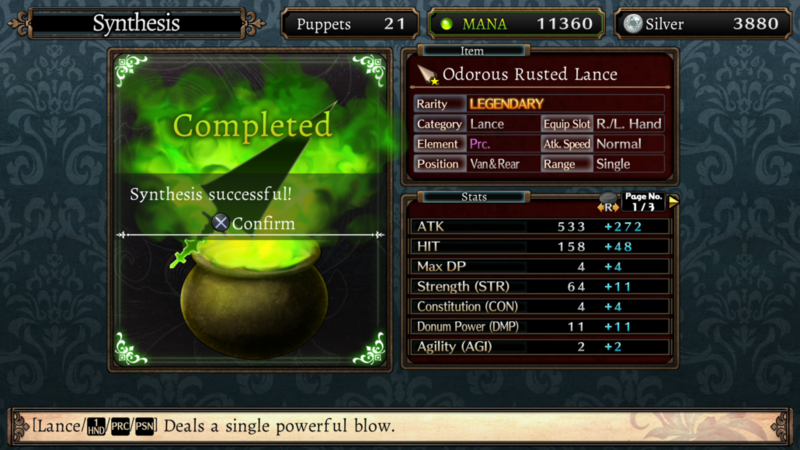 A story can be nice and all, but the real star of any dungeon crawler doesn’t appear above ground. Those auto-mapping floors are home to all manner of beast and foe and will be the player’s new home for the next couple hundred hours of their life. The Labyrinth of Refrain won’t just be about going down as far as you can. New dungeons can be found with proper exploration, each with their own biome, gimmicks, and native denizens to kill for loot/EXP. Usually, new shortcuts are unlocked at the start of each new dungeon and every few floors thereafter, so there’s never any need to start your spelunking at floor 1 every time (which is incredibly inefficient, as experience and mana gains simply go up exponentially the deeper you go). Each dungeon typically hides a few extra floors and locked treasure chests that you couldn’t reach the first time you made it through, so coming back for repeat trips isn’t necessarily a bad thing if you know what you’re looking for. 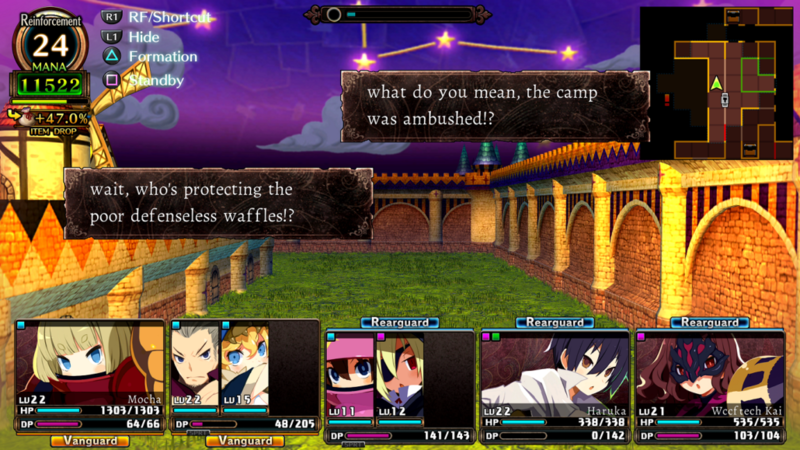 No dungeon trip can be an indefinite adventure in Labyrinth of Refrain because of two mechanics that continually work against the player’s favor. A mechanic known as Reinforcement keeps the player from breaking through any wall they see or hiding from enemies. While it may be tempting to use all of your Reinforcement points in combat, you’re going to want to keep a small stash on hand to create an instant exit back to safety before your party gets wiped out. The other mechanic is through the collection of Mana, a sickly green substance that Dronya uses in all of her witchly affairs. The more Mana you collect, the higher your drop rates and other beneficial effects, but gathering too much will summon enemies that go are above and beyond what the party’s strength should be for that floor (each floor has its own threshold for maximum Mana capture). Later on, you’ll unlock abilities that allow you to start off a new dungeon run with a fraction of your banked Mana on hand, giving an immediate boost to item drop rates, perfect for any efficient treasure hunter. When not mapping the depths of the underground labyrinth, much of your time will be spent in turn-based combat. While the terms may be different in Labyrinth of Refrain (fortifying versus defending, Donum casting instead of simple magic), this is very much a familiar style of RPG if you’ve spent any amount of time with Wizardry or Etrian Odyssey. The tools at your disposal in combat can be fairly limited compared to other RPG’s, such as having your spellcasting abilities be limited by which Pact/squad your members are a part of rather than being learned from the class themselves. This makes having a dedicated healer a little less important, as anyone else with enough MP to spare can be a part of a healer’s coven and keep your party topped off. However, going into a dungeon without a dedicated tank setup is just asking for disaster. Most any enemy you encounter at your level is capable of taking a party member out in just a couple quick hits, so you’re going to want to raise up a character or three that can either take a hit to the face and shrug it off or dodge out of the way; doubly so, it’s important to raise their Charm levels up and stick them in a Coven that can increase how often they get attacked. After all, having an invulnerable tank won’t do you any good if they’re not able to intercept hits from hitting the back row. At the start of Labyrinth of Refrain, you’re rather limited by the puppets that you can take along on your adventure. Five members are usually the sweet spot for a dungeon crawler, so that seems like a good amount, right? 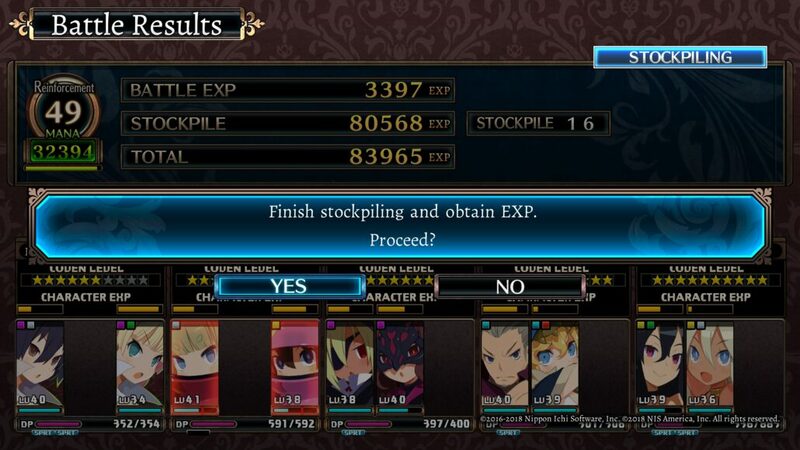 Well, in standard Disgaea flair, those are rookie numbers. No, you’re looking at five *squads* to command in battle. When I say squads, I’m talking three front-line members and five cool puppet folk to hang out in the back to pump up your squad and give them additional boons. Now, you’re not going to have immediate access to controlling forty puppets at once. Even at the fifty-hour mark, I was just barely getting to the point where I had two attackers and another two in support. Your squad potential is limited by groups known as Pacts, which are formations that your squad can take. Usually, these come by way of quest reward, enemy drop, or random loot scattered throughout the dungeon. Potential slots for party members are limited by these Pacts, but they, in turn, offer various stat increases, adjusted EXP gains, and even limit what members can be used in terms of class and gender. I discovered one such Pact midway through Labyrinth of Refrain that provided such great bonuses to a class known as Theatrical Star that, when combined with a piece of armor that sent her evasion rates through the roof, made her the single best tank in my party over the DEF-stacking pair I had used for much of the game prior. In proper Disgaea fashion, it isn’t just about making a character the single best at their class through leveling up both character and fusing gear. Later on, you’ll unlock the ability to transfer souls from one puppet to the next, bringing along unique skills from the previous class as well as increased stats to offset the handicap of having to level back up from level 1. The crossbow-wielding Mad Raptor class comes with a few speed boosting skills that could easily benefit any other class in your party, for example. Labyrinth of Refrain: Coven of Dusk isn’t just your standard dungeon crawling JRPG, it’s a JRPG done in excess. Everything from the excessive roster counts to excessive stat and damage potential, and even an excessively underutilized potential for story, come together to create an RPG that’s a perfect fit for the studio most famous for Disgaea. 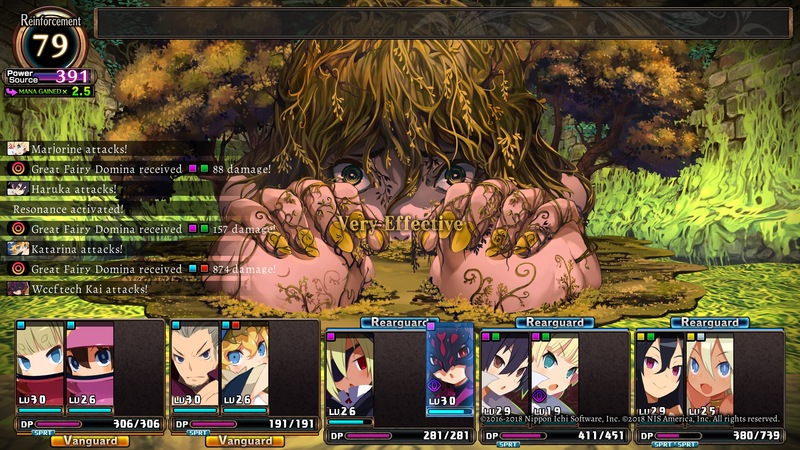 If you’ve been enjoying Etrian Odyssey and wished everything there was available at a magnitude of ten, Labyrinth of Refrain’s certainly an RPG to be excited for. Solid dungeon crawling that easily matches the polished output from Experience, Inc.